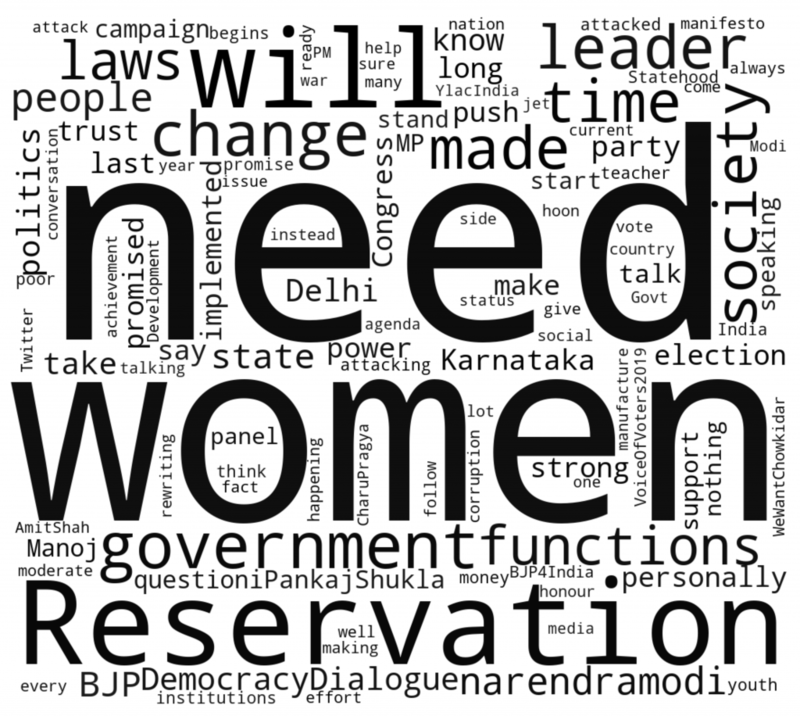 Earlier in our ongoing blog series on the forthcoming Indian parliamentary elections we had characterized the following network of verified political handles. 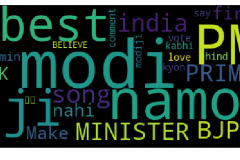 Today we share the results of analysing the follower/following patterns of these handles amongst each other. 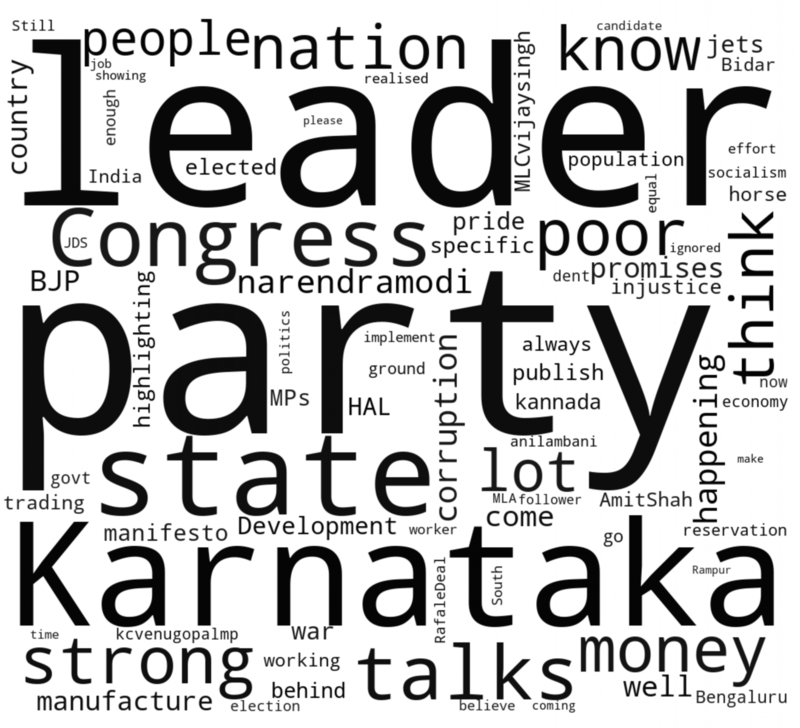 To understand the interactions between the political handles (otherwise parties), we populate a table which shows the ratio of total number of followings of one party to another by the total number of handles of that party. Below is the table with all the counts of followings of each party’s members against another party’s handles, e.g. 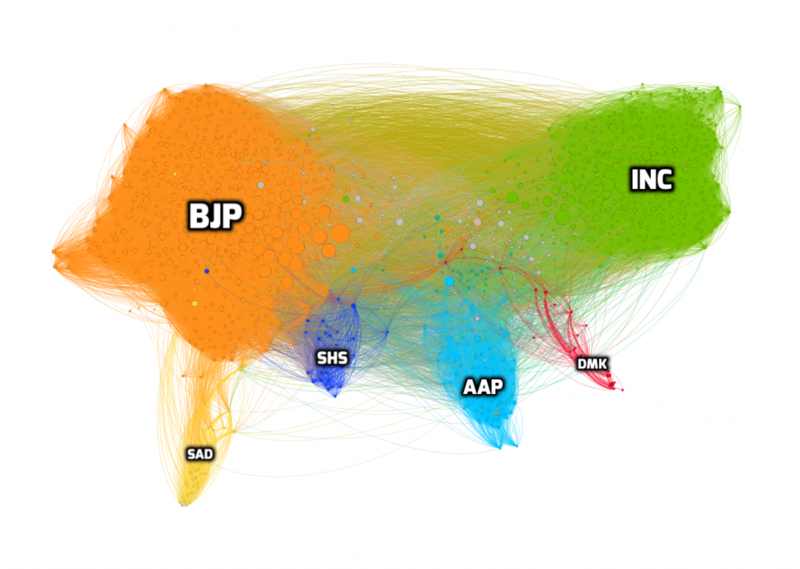 total number of connections from all AAP accounts following BJP accounts is 912. Next, we were interested to see, that on an average, how many handles of another/same party does a political handle from a given party follow e.g. on an average how many BJP handles does one AAP handle follow. Using the table above, we calculated this for each party; for example, the average Shiv Sena (SHS) political handle follows ~17.47 other Shiv Sena political handles. An average INC handle follows 4.08 BJP handles while BJP followed 2.82 INC handles. We find that the diagonals in the tables to have the highest values, i.e. handles of a party follow other handles of their own party more. From the table above, some interesting insights can be gathered. Most handles of political parties (but for those affiliated with Samajwadi Party (SP)) follow more BJP handles than INC handles. This also holds true for the category Others which under its umbrella houses several small regional parties such as All India Trinamool Congress (AITC), Biju Janata Dal (BJD), and Telangana Rashtra Samithi (TRS), to name a few. Additionally, alliances can be clearly seen in some cases with handles from one party following a higher number of handles from the other party on an average. 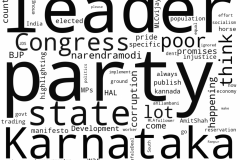 The average political handle affiliated with Shiromani Akali Dal (SAD), Shiv Sena (SHS), and Telugu Desam Party (TDP), all parties supporting the National Democratic Alliance (NDA), follow many BJP handles as opposed to an INC handle on an average. 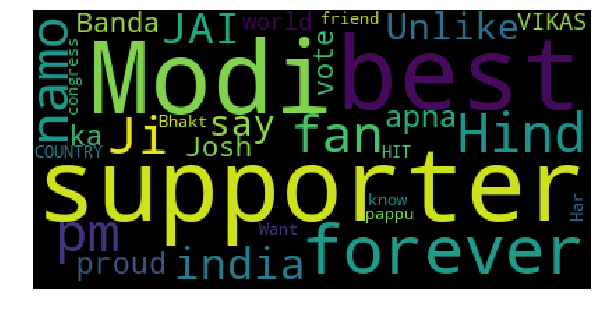 For example, the average SAD handle follows as many as eight BJP handles, but hardly follows an INC handle. Also, parties such as Aam Aadmi Party (AAP) and Samajwadi Party (SP), otherwise unaffiliated with either alliance, follow a larger number of one particular party; the average AAP handles follow BJP handles more, whereas, the average SP handle follows INC handles more. 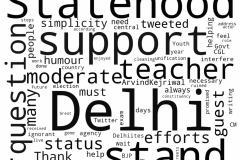 On the 11th of January 2019, Twitter India started a new initiative, #ChaupalOnTwitter, geared towards encouraging open dialogue around crucial topics and direct conversations with politicians (Twitter’s blog on this). Since then, a total of 11 #ChaupalOnTwitter have been hosted; three each by BJP & INC leaders, one each by a SP, RJD, TRS, AAP, and JMM leaders. Out of these 11 events, nine were organized for male politicians while two were for female politicians. Below is the list of all Chaupals done with the number of views for the corresponding live stream of the Chaupal. 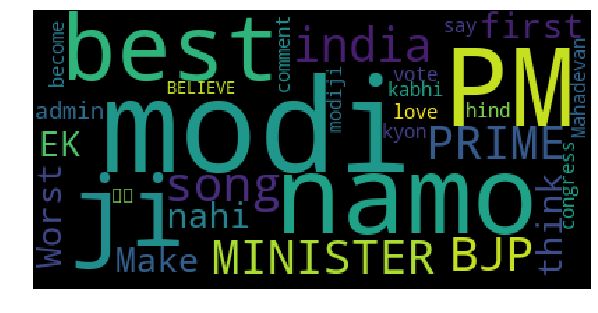 We extracted the mentions of all political handles from the tweets for the Chaupals conducted post March 26th. 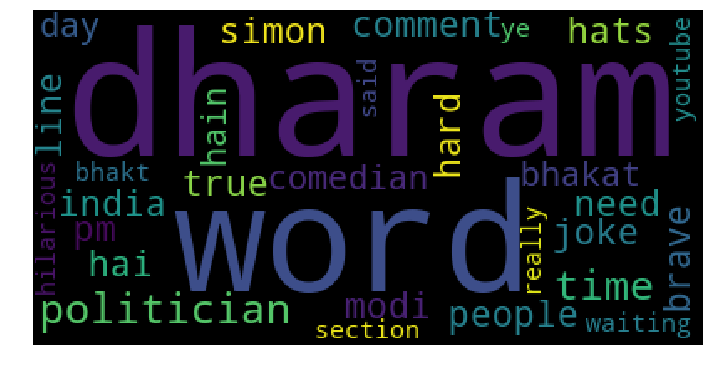 We found @siddaramaiah to have 1,943 mentions, @ManojTiwariMP with 1,590 mentions, and @dineshgrao with 932 mentions. 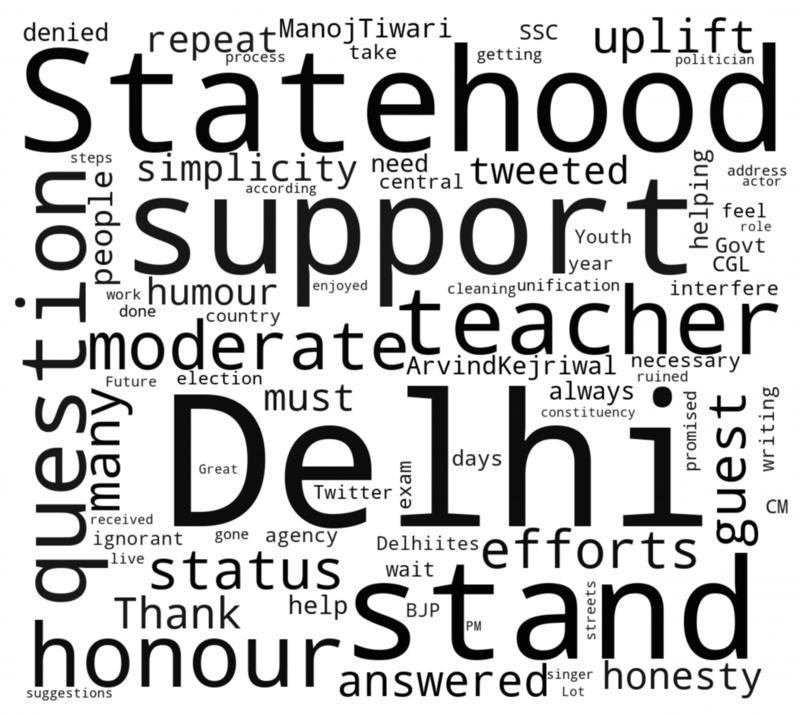 In total, we collected 10,954 tweets having one or more of the following hashtags: #ChaupalOnTwitter, #CahaupalOnTwitter, #ManojTiwariKiChaupal, #AskSiddaramaiah, #GadkariJiKiChaupal, #SatyapalKiChaupal, #AskMPKavitha, #TejashwiKiChaupal, #TwitterLive, #AskDineshGunduRao, #ManojTiwariKiChaupal, #TwitterChaupal, #AskSiddaramaiah, #CahupalOnTwitter, #ElectionsOnTwitter, #DemocracyDialogue, #VoiceOfVoters2019, #AskSupriyaSule, #AskEduMinMSisodia, #Powerof18, #हेमंतकीचौपाल, #अखिलेशकीचौपाल, #ಸಿದ್ದರಾಮಯ್ಯನವರಿಗೆನಿಮ್ಮಪ್ರಶ್ನೆ. 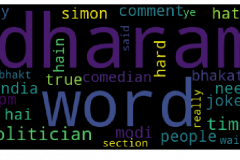 This is a rough estimate of the number of tweets talking about the Chaupals. Out of these 10,954, we found that 8,496 were re-tweets and 564 were re-tweets with comments. We also analyzed the distribution of the languages for the tweets posted. 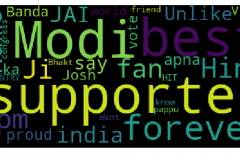 We found English to be the dominant occurrence with 49.6% of tweets collected, Hindi followed with 30% of tweets collected, Kannada came at third place with 18.3%, others being Tamil, Marathi, Gujarati, and Telugu. 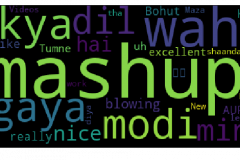 The image below is the word cloud of the high frequency words across all the Chaupals together. 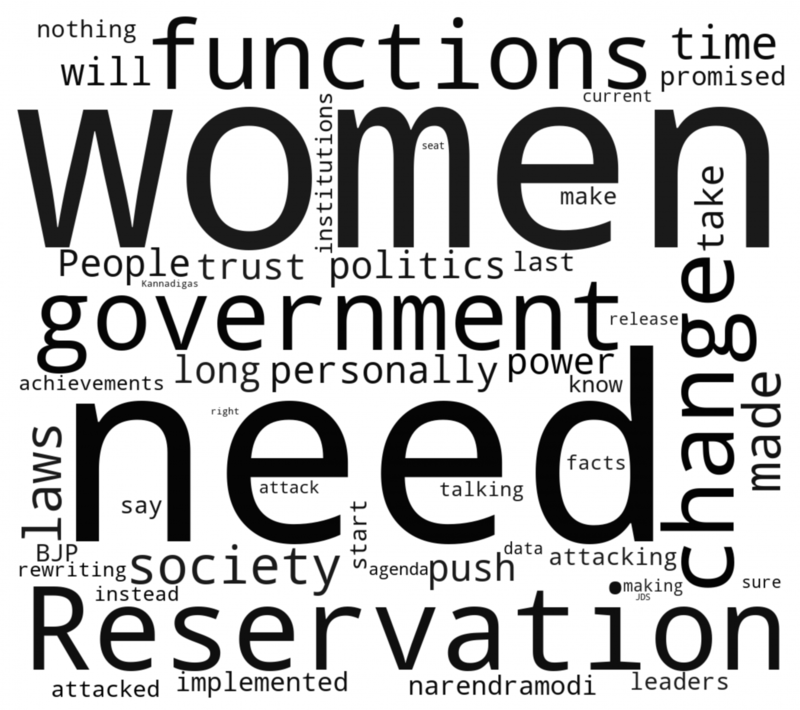 These word clouds clearly depict the prominent topics that were discussed / brought up during these Chaupals. As the campaigns build up, and the parties partake in slandering one another, many satirical videos have emerged. These videos are predominantly uploaded on YouTube and then cross-posted and shared around and discussed on platforms such as Twitter. We were interested in analysing the reach of these videos. 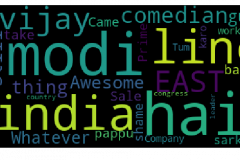 Here are the list of videos that we found from YouTube (as of 2nd April) that we analyzed. 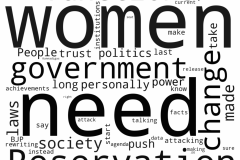 Hashtags at the end of the video serve as the reference for the corresponding video for the rest of the blog. We analyzed the Views, Likes, and Comments (both the number, and their content), Dislikes, and compute the Like/Dislike ratio for each of these videos. The table below (arranged in the decreasing order of Views) lists their engagement on YouTube with the number of Views and Comments garnered. The following table lists the videos with the number of Likes and Dislikes, and the ratio of the Likes to the Dislikes for each of the videos.